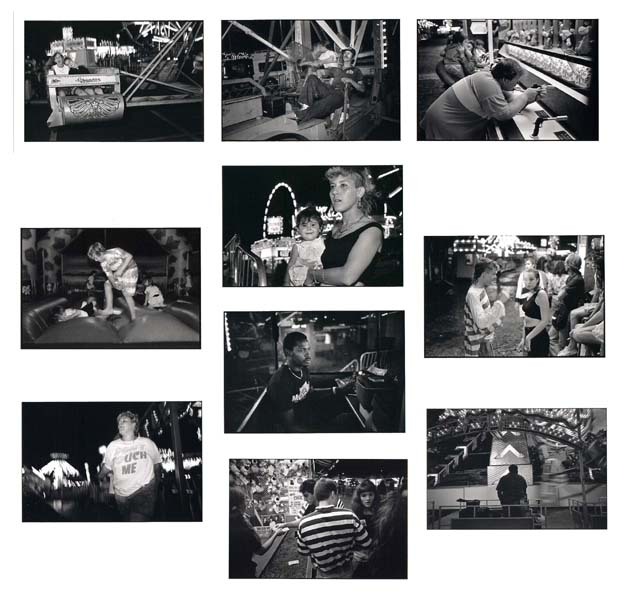 In the spring and summer of 1990 I spent a dozen evenings photographing the activities of a traveling carnival, the Coleman Brothers Show, as it made its rounds in rural New York and Connecticut. Far from being a simple entertainment, I find the carnival to be a dramatic and in many ways unsettling form of theater. Audience participation is central, by definition. But the carnies aren't just ride operators, they are showmen and the carnival is show business. These are some of my favorite pictures from the project. All the photographs were made with Leica cameras and lenses, often using a small electronic flash to provide fill light. I like to present the work as big prints, 12x18 inch enlargements in gelatin silver. UPDATE: Beginning around 2014 I began to experiment with earlier work originally meant for silver printing, scanning the negatives and then producing enlarged digital negatives intended for platinum/palladium printing. I'm especially pleased with the way these night time carnival pictures have translated to the Pt/Pd medium.